As announced on the Dark Horse: CLASSIFIED! 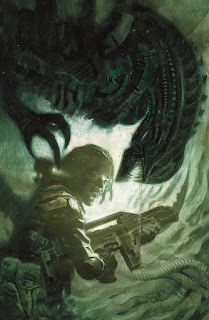 panel at New York Comic Con, writer Brian Wood (The Massive, Rebels) and artist Tristan Jones (Mad Max: Fury Road, TMNT) will take on the xenomorphs just in time to celebrate the anniversary of Aliens with a new ongoing series—Aliens: Defiance! “Alien was groundbreaking when it first debuted, and has only grown in relevance and pop culture legend since,” remarked Wood. “Thirty-seven years is an impressive amount of time for any entertainment property to thrive, much less still top mainstream headlines and fuel speculation like it does. It’s an honor to be invited to add to that legend.” In space, no one can hear you scream . . . Aliens: Defiance follows struggling Colonial Marine rookie Zula Hendricks as she goes AWOL to protect Earth from an unknown alien species. Aliens: Defiance #1 (of 12) is in stores April 27, 2016. Preorder your copy today at your local comic shop!